A Time Spy benchmark score of one of NVIDIA's upcoming RTX 20-series graphics cards has come out swinging in a new leak. We say "one of NVIDIA's" because we can't say for sure which core configuration this graphics card worked on: the only effective specs we have are the 8 GB of GDDR6 memory working at 14 Gbps, which translates to either NVIDIA's RTX 2070 or RTX 2080 graphics cards. If we were of the betting type, we'd say these scores are likely from an NVIDIA RTX 2080, simply because the performance improvement over the last generation 1080 (which usually scores around the 7,300's) sits pretty at some 36% - more or less what NVIDIA has been doing with their new generation introductions. The 10,030 points scored in Time Spy by this NVIDIA RTX graphics card brings its performance levels up to GTX 1080 Ti levels, and within spitting distance of the behemoth Titan Xp. This should put to rest questions regarding improved performance in typical (read, non-raytracing) workloads on NVIDIA's upcoming RTX series. It remains to be seen, as it comes to die size, which part of this improvement stems from actual rasterization performance improvements per core, or if this comes only from increased number of execution units (NVIDIA says it doesn't, by the way). don't delay, buy today ! My GTX1080Ti and GTX1080 had scores of 10.5k and 7.8k respectively on 2025 MHz (with a similar CPU score, so assuming 4c/8t from the screenshot). For it to be as close as the Titan X Pascal is impressive. Don't forget that the driver the guy used is not even optimized for it when he benched it. So that means the 2070 isn't going to follow the previous pattern of being (almost) as fast as the previous gen's Ti model but they still expect another $100+ for them. Running at faster clocks, eating more power, and costing more money? Doesn't seem that impressive to me. Don't forget that the driver the guy used is not even optimized for it when he benched it. What's that supposed to even mean ? Is there a driver that is "optimized", why didn't he used that ? Pre-release drivers...there won't be an "official" or optimized drive until later. That way that was phrased is that the "optimized driver" or official or whatever was available and he chose not to use it. If the damn thing is already available, what the hell is the point ? Optimised for what, a benchmark they have access to on hardware they designed and built, have tested, developed drivers for common operating systems, finalized specifications, released to manufacturers, built, and are shipping to retailers for retail sale in less than 30 days after claiming this was a 10 year Project? 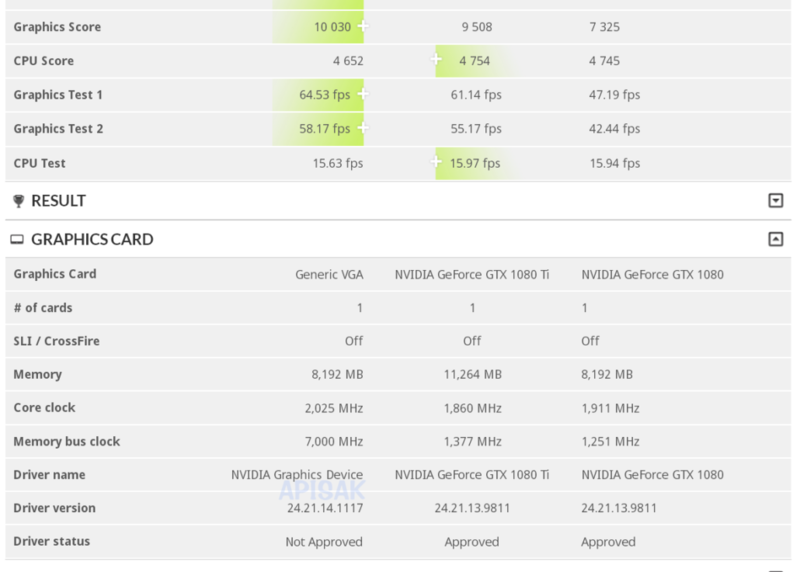 i know,but think why new rtx 2080 gpu put power in that it just win OLD gtx 1080 or even gtx 1080 ti,bocoz different of ti and not ti version are about 20%? no sense. it would be awesome to be wrong. But nope, I give up. I seen too much sh*t came out from this gpu monopoly that now I have lost any hope. This will be the first time in hw history that new gen hw bring the same price/perf. ratio (or worst) of the old one. I don't think this "puts to rest" any worries about performance gains. It was hardly long ago when the 970 took on the 780Ti at a much lower, AFFORDABLE price point, and then the 1070 won over the 980Ti, although at a price premium which should not have been the case. Now you need an even more costly 2080 card to compete with a 1080ti, which means the 2070 will not be a match for it. So there ya go, lower performance, at a much higher price ---> Nvidia fleecing us. Perfomance per transistor in regular games comes crashing down. turing adds 60% more transistors, 2080Ti stock is slower than 1080Ti 2025Mhz @ 250Watts. So according to this, you are supposed to get a +5% boost from 1080 Ti for 850-900$. Deal of the year. If you take the quality of NV drivers of the last months, or even 1,5-2 years, a pre-released driver may not be as bad as it sounds. 1080Ti @2025MHz is not faster than stock 2080Ti. For a comparison, this is what my overclock GTX 1080 TI scores. just for reference my pair of 1070 cards score 11112 in timespy.. better than 96 %..
thats on a low power mining setting..
that's 2 GTX1070 in SLI, not in single card config. Of course it'll beat single GPU setup in benches... (not really surprised, IMO) Until then, I'll wait for more reviews & benchmarks. This one just scratched the surface.